Sidescroller Hey! Pikmin is out July 28, and will launch alongside its own adorable amiibo. Grezzo's desert-themed RPG Ever Oasis will be out June 23. Monster Hunter Stories looks like a kid-friendly, turn-based take on the popular franchise and will be out this fall. Yo-kai Watch 2: Psychic Specters is the definitive version of last year's Bony Spirits and Fleshy Souls, combining the two and adding a bunch of features. It'll be out this fall. Board game RPG Culdcept Revolt will be out on August 29. RPG Maker Fes will be out on June 27, and you'll be able to share your games with anyone with a 3DS thanks to a free RPG Maker Player app on the eShop. The Mii-themed Miitopia is still slated to come out some time in 2017. Fire Emblem Echoes: Shadows of Valentia will naturally get a variety of paid and free DLC maps, and will also get a season pass. Details on pricing is forthcoming. 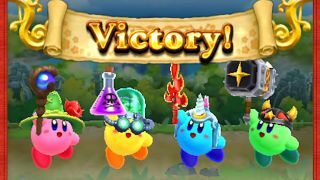 Team Kirby Clash Deluxe is a free-to-start multiplayer brawler, and launches today on the eShop. Kirby's Blowout Blast lets you inhale enemies and spit out huge bullets in 3D score-attack stages. It's coming to eShop this summer. There's also an unnamed Kirby-themed multiplayer action game coming this holiday, but details are as specific as the title. The final entry in the Boxboy trilogy is called Bye-bye Boxboy!, and it's on the eShop today. Those games are great and you should pick it up, but if you need convincing, there's a demo on the eShop too. Lastly, three new Zelda amiibo will arrive June 23, and the Cloud and Bayonetta Smash Bros. amiibo will finally be available July 21 in two different versions. And of course, some are going to be retailer exclusive, because nothing can ever be easy in life.